FUN DAY WITH YOUR DOG! Ever watch those AKC (American Kennel Club) agility trials on TV and wish you and your dog could do that. But they’re so fast! And some of those obastacles seem pretty complicated for your fluffy friend! Guess what. There are other agility programs available. Katie and I recently did a fun day of agility, this time under NADAC (North American Dog Agility Council) rules with NADAC equipment. Where UKC (United Kennel Club) goes for precision (straight on and off equipment such as the dog walk) and safety, NADAC encourages speed along with precision. But there’s another step toward safety in their equipment. They like to use hoops (think big croquet hoops or see picture on http://k9corps.club/ an Appleton, WI NADAC club) for the dogs to go through instead of jumps, which is a great boon for dogs with joint issues. They have fewer types of obstacles and the courses are set up for good flow (not so many tight turns). They also have numerous types of course. If you have a dog particularly good at tunnels, there’s a course that’s almost all tunnels. Our fun day wasn’t a trial, so there were no ribbons. 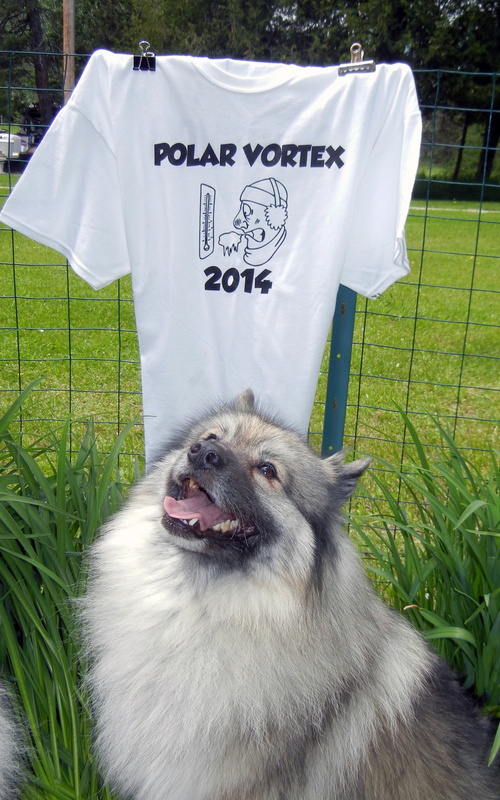 But, because it was all in fun, we did “win” a t-shirt representative of our past winter. See the picture from June 1, 2014 from just north of where I live. 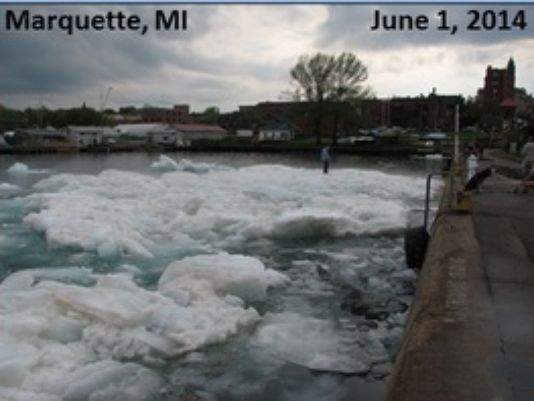 Our ice-capped Great Lake Superior even made the national news. Have fun…whereever you are with your loveable, four-footed companion! This entry was posted in DOG TALK and tagged agility training, dog companions, dog friends, dog shows, dog trials, fun with your dog, Keeshond, Keeshonden, living with the well mannered dog, Loving our pets, obedience training, pets, Woman's Best Friend on June 12, 2014 by Barbara Raffin.